Author JS Waters was kind enough to discuss his debut novel, The Modern Primitives with The Crazy Bookworm. 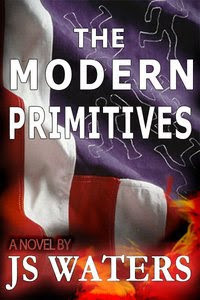 JS Waters’ debut novel The Modern Primitives (Draeconis, Nov 2010) tells the story of a disillusioned heir to a law enforcement dynasty who forms a vigilante group to seek revenge against the gangsters who murdered his brother. He is the author of the screenplays, The Nephilim and Keepers of the Dead, and the creator of Cyberworld: Dark Ages of the 21st Century, Afterholm, and Espionage live action roleplaying games produced by Dark Age Publishing. He has a BA in Teledramatic Arts & Technology from CSU Monterey Bay and has been writing professionally for sixteen years. He currently lives in Portland, Oregon with his wife and three children. Q: What is The Modern Primitives about? A: At its core, The Modern Primitives is about one man’s journey of redemption through vigilante justice. But the story also explores the bonds of friendship, fidelity and the neo-tribalism of surrogate families. The violence of street gangs has spread from the common place of urban centers like Los Angeles, Oakland, New York and Detroit to smaller, suburban and rural communities all across America. While the American judicial system remains broken despite the rise in prison populations, police fight a losing battle against urban terrorists. The tribal nature of street gangs, these new, modern primitives, spreads exponentially with the decline of traditional families, providing disassociated youth the emotional, physical and financial sense of family they so desperately crave. Q: The Modern Primitives is set in Salinas, California. The very heart of Steinbeck country. How did you come to write this particular story and are there any parallels to Steinbeck’s work? A: The Modern Primitives began as a screenplay in 2001. I got the idea for the story when one of my friends was jumped in front of the Cherry Bean Coffee House & Roastery. I had seen a lot of these type of attacks downtown. Random carloads of thugs jumping out and throwing a beating on some isolated and vulnerable individual, then fleeing the scene. I finished the script in 2003. But my children were young and I had taken over the family business, so I put the project away and took a hiatus from writing for six years. In October of 2009 I took a trip to Lake Tahoe. During the 12 hour drive I made the decision to novelize the work and to really flesh out the original concepts. Steinbeck wrote about the corruption and evil of the Salinas Valley. He exposed the exploitation of the workers in the fields and the racism that existed. Nothing has changed. The faces are different but the core problems remain. Salinas is flooded with illegal aliens and migrant farm workers. Employed by the unscrupulous businesses looking for cheap labor. With the workers come the gangs and the crime. Generation after generation of criminal families born and raised from the fields. Children of immigrants. Searching for the American dream with a gun in their hands. Q: What was the significance of the piercings and tattoos in The Modern Primitives? Is there any correlation to the modern primitive counter culture movement? A: In both prison and on the street, tattoos tell a story. Signifying allegiance and rank. Visible expressions of power. For the Cherry Bean Crew the tattoos represent their bond of friendship. Loyalty made sacred through ritual pain and scarification. A rite of passage for the tribe. Their common denominator. Expressions of emotional trauma. Their spiritual armor. Scott’s piercings manifest as a warning. An emotional deterrent for a physically imposing character that sets him apart from his friends, family and community outside the group. His exterior is meant to appear savage and intimidating. Masking the terror and self loathing he feels inside. To the uninitiated the piercings represent an endurance of physical pain and suffering. I’ve always felt that the modern primitive movement has been about community and tribal acceptance through primitive forms of expression and ritual. Some of the same concepts exist in street gangs. Their members seek acceptance, self identity, recognition, love, belonging and discipline. Q: The main character, Scott Wilson has some very strong opinions about the criminal justice system in America. How do those differ from your own? A: They don’t. The system is broken in so many ways it’s almost impossible to know where to begin. We are a nation of laws. The problem is we have created so many petty laws that it doesn’t seem to make sense. We incarcerate more citizens than China, yet we’re only a fifth of the size. Our prison terms are too long for non-violent offenses and not harsh enough for violent crimes. We should be treating non-violent drug addicts medically, not locking them up like criminals. If America de-criminalized drugs, prostitution and gambling you would see an end in organized street crime. Prohibition made the mafia. Cocaine, crack and Meth built the cartels. Q: How did the real gang violence of Salinas shape your story? A: Salinas had 29 murders in 2009 with a population just under 150,000. All gang related. This may be a new record for city but it’s nothing new for its residents. For more than three decades Salinas has been a hub for gang violence. I’ve seen it firsthand. I was born in Salinas and grew up during the rise of the gangster era in the late eighties. I lived there until 2007. It was publicly ignored by the city administration in the early part of the 1980’s. Treated as an isolated problem in the economically depressed Eastside. Not exactly front page news back then. But by the end of 1992 the violence had spilled into the lives of mainstream Salinas when the murder rate hit an all time high. The city finally acknowledged the problem. They banned cruising on Main Street. It was the end to our American Graffiti era. But the violence persisted. Q: Is The Modern Primitives based on true events? A: I’ll never tell. Q: The graphic violence in the novel is both powerful and uncomfortable. Was it difficult to write? A: Violence is today’s pop culture. I grew up on it. Watched it erupt around me in real life growing up in Salinas. It’s on the news every night. I see the nature of it. I’ve heard it said that violence is taught. I would have to respectfully disagree. I think violence has always been at the core of human nature. We are the most destructive force on the planet. To ignore its existence is to ignore the truth about ourselves. This nation was built on violence. Empires born of it. History written by the perpetrators of it. The truth on the street is the man with the gun holds all the power. Q: Did you worry that the explicit language and brutal theme of vigilantism might alienate some readers? A: No. Not at all. Profanity has worked its way into our daily vocabulary. A product of American pop culture. I’m a storyteller. My role is to reveal the inner truth. The character’s in my book come from a fictionalized version of the real world. Crime is real. Gangsters are real. Homicide is common in these communities. The dialogue is authentic. Capturing the seedy underbelly of society. It’s the way people on the street interact. I’m giving the reader a glimpse into the reality many would never want to experience. With regards to vigilantism, we have all witnessed injustice at one time in our life. Felt helpless or afraid. I think the characters allow us to live out those fantasies vicariously. Dark heroes who act as the lesser of two evils. Q: What was the meaning behind the cover design? Why the burning flag? A: I was driving one day and saw a support America sticker on the back of a car. I had been thinking of a cover when it hit me. The burning flag represented the destruction of America. Like you might see on CNN. Protestors from a foreign country wanting to bring down the mighty United States. The chalk outlines signified the victims of the gang war. The innocent who gave up their lives needlessly. I wanted Americans to be pissed off about gang violence. I wanted to illicit a response of action. I wanted it to serve as a warning to where we are headed in small town America. Q: Are you afraid there may be some backlash from your work? A: No. There’s nothing truly scandalous in this book that isn’t common knowledge in the community. You can read it weekly in the Californian newspaper. But you’ll never know what it feels like to live the lifestyle from an article. It’s hard to grow up in a place like this without some war stories. It changes you. I was eighteen the first time someone pointed a gun at my head. I say first time because it wasn’t the last. The violence is everywhere. It’s not confined to the ghetto. You learn to keep your head down. Taught to not to make eye contact. You avoid the parks you played in as children. Shop in Monterey rather than at Northridge mall. You keep your kids close to home. Modify your lifestyle. But they‘re in Monterey too. Q: How often do you visit Salinas? And when you do, where do you go? A: My parent sisters still live in the Salinas Valley, so I get to go home at least once a year. I spend a lot of time at Nepenthe in Big Sur, Lollapalooza in Monterey, Wills Fargo in Carmel Valley and Smalley’s Round Up in Salinas. Definitely start my day back home at the Cherry Bean. You can usually find me at the beach or out in the bay. I love the ocean. Santa Cruz Beach Boardwalk in the Summer. Q: What is your writing routine? A: I write sporadically. Some days I will write in the afternoon when the kids are in school and try to stop before football practice. Other days I will work straight through the day into the early morning. I’ve been known to go on binges for several days. Stopping only to eat and shower (I get my best thoughts in water). Then I won’t write for a few days. Relaxing. Spending time on the water or watching two, sometimes three movies a day. I’m not a well balanced person. Sort of an all or nothing personality. The break gives me clarity. Q: Who are your favorite Authors? A: To the fallen heroes I salute JRR Tolkien, Edgar Allen Poe, James Joyce, Ian Fleming and Michael Crichton. In contemporary fiction I would have to count my top five as Tom Clancy, Clive Barker, Anne Rice, Stephen King and Toni Morrison. Q: What are you working on now? A: I’m adapting another screenplay into a novel called The Nephilim. A supernatural thriller about the son of a fallen angel who conspires to kill the Antichrist in order to stop the Apocalypse and find his own redemption. http://www.themodernprimitives.com/ A Big thanks to JS Waters.